After the open, not even a gigantic beat by AAPL was enough to make this dead cat bounce. The fruit company so many people love hating on managed to beat expectations while announcing a $100B buyback. 100 BILLION DOLLARS. What do we think the commission being charged on that buyback is at Goldman or JPM or wherever it’s done? Zero dollars or negative zero dollars? Michael Batnick talked a bit about it here and if you’re in the camp of “why don’t they just spend it on R&D” know this: they’ve spent $41B in the last 19 quarters on guys in a room saying “what should we build next?” What an absolute juggernaut run by a Hall of Fame CEO. Other winners APTV, CNC, GRMN, MA, and CAH. What else? SNAP fell 21% to a new all-time low. Remember in their prospectus how they said one of their biggest risks was that “we may never make money”? Alllrighty then. Other than an app that turns your face into a puking unicorn the two biggest losers were UNM -16% and TAP -15%. Hold on ONE SECOND HERE. TAP down 15%? Miller LITE is a fantastic beer for a warm summer night and we got plenty of those ahead! (don’t @ me with your flowery tasting 7.5% single barrel brewed red chair quadruple saison IPA from the foothills of Oregon. I get it. LITE is still good). By lunch we were waiting for the Fed to give us some guidance about the future. At 2pm ET we got the Fed meeting and I’m going to point you to Tim Duy because the guy literally knows everything about Fed policy. The market reacted positively to what it viewed as a dovish statement but in the end all those things I mentioned earlier are more important right now. My gut also tells me that “dovish Fed statements” don’t have the punch they used to because we aren’t in “easy mode” anymore. The dollar initially dropped but ended the day on its high but that’s a topic for another recap (not good). 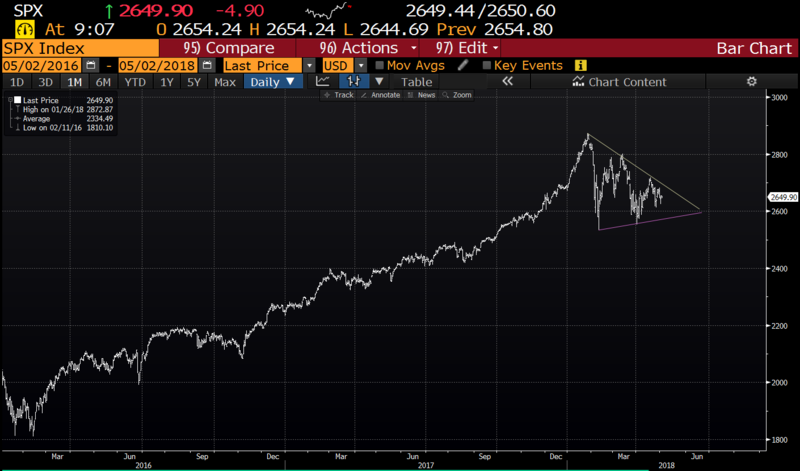 Look, if you’re a stock market bull you have to hope that this correction is just the start of a path towards new highs because Bears are going to rage about the first paragraph. Price action is HORRENDOUS right now, it is F level bad. I mean @northmantrader put it best: “The 2 largest companies on the planet with a combined market cap of over $1.7 Trillion have rallied 7.8% and 8.8% respectively in the past 6 days yet $SPX is flat”. Final Score: Dow -72bps, S&P500 -72bps, Nasdaq -42bps, Rus2k +30bps. Succinct Summation of the Day’s Events: AAPL crushed earnings. SNAP didn’t. A somewhat Dovish Fed statement + blockbuster earnings from the biggest company on the planet wasn’t enough. Marketwatch on the Wall of Worry: By at least one measure, corporate earnings are the best in nearly a quarter-century. However, the stock market is not enthused! Imagine using CAPE to make decisions on a portfolio. In the past 20 years, the S&P 500 has sported a CAPE Ratio above its historical average 97% of the time, or 233 out of 240 months. Only in the brief period from November 2008 through May 2009 were stocks deemed “undervalued,” trading at valuations below their long-term average. Dear investors: my plan to buy stocks when they are “cheap” isn’t working like it’s supposed to…. This whole “move financial services from NY” thing is in like inning 2: In a memo to employees, AllianceBernstein cited lower state, city and property taxes compared with the New York metropolitan area among the reasons for the relocation. Nashville’s affordable cost of living, shorter commutes and ability to draw talent were other factors. Boy Coachella looks awesome! Phone….phone….phone….phone….